Using an arsenal of project management technology and a solid foundation of experience in strategy consulting, we analyze a company’s strengths and weaknesses in order to structure a plan for moving forward. We strive to understand the existing interpersonal, communications, and cultural patterns within a company, and work with the corporate culture instead of against it. All stakeholder groups are included and listened to during our process, ensuring full alignment and buy-in from all. 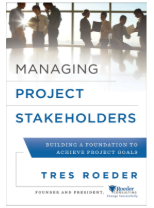 As an industry leader in project management and stakeholder relationship-building, Roeder Consulting is the creator of a number of original works on effective project management.